BLOODLETTING now available with Spanish subtitles! Thanks to the generous work of the VIVE Venezuelan TV, the documentary is now available with Spanish Subtitles. If you are interested in purchasing a copy with Spanish Subtitles, please send an e-mail to Nicole @ nicomo@sbcglobal.net. English copies are available for $25 [plus $4.95 shipping and handling]. To order your copy in advance, donate via paypal, or send us an e-mail with a request to order the DVD. 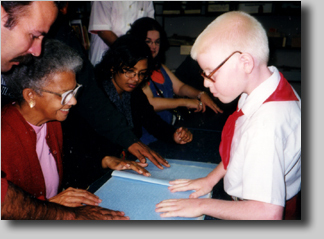 "El Jefe," a child in Cuba with visual impairments, shows a U.S. delegation of healthcare professionals braille books. *** SPECIAL JURY AWARD ! 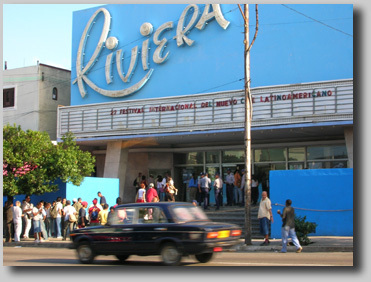 Nuevo Cine Latinoamericano was held this year. 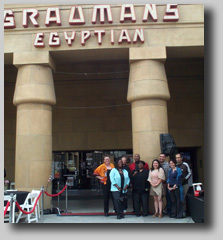 Supporters at Bloodletting showing at Egyptian Theatre in Hollywood. "This intensely personal story of one uninsured family's interaction with the American health care system is a call to action. More than 45 million Americans like the Greens are forced to choose between financial crisis or their health. It's a choice that not one of us should ever have to make. If you're not already an activist in the fight for quality, affordable health care for all, this film will inspire you to sign up." "Bloodletting is an important and timely film that challenges government policymakers and the American health care industry to end the the shameful and disgraceful disparities in America's health care system in which the wealthy receive the highest standard of health care while millions of Americans are totally shut out of adequate health care." "Greens intensity pushes the viewer out of the arm chair and into the arena of action... The stunning visuals and original sound track set the tone for this hard-hitting, emotionally intense docu-drama about real people dealing with life and death issues of a failing healthcare system." 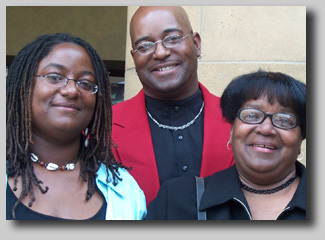 Director Green and family who starred in the documentary at Hollywood premiere. 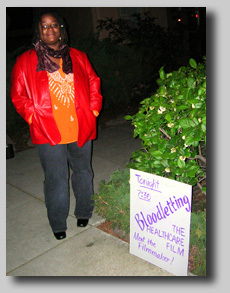 In February, 2006, Bloodletting showed to an enthusiastic audience in Larkspur where filmmakers joined Carol Cross who spoke about the next Pastors for Peace caravan to Cuba, and the Cuban Medical School for foreigners. Thank you to Sheila & Erno of Marin Interfaith Task Force on the Americas who inspired this wonderful event! In July, 2005, Bloodletting: Life Death Healthcare came home! This was the first festival selection where BLOODLETTING was shown in its hometown, Oakland. Bloodletting: Life Death Healthcare was selected for the prestigious Artivist Film Festival which took place in the Egyptian Theater in Hollywood in April, 2005. The Artivist features artistic, activist films. Bloodletting played as a featured film in their human rights category, winning a high level of audience enthusiasm based on a survey by UC Irvine. Filmmaker Lorna Green attends community showing in Marin County, California. Molecules Creations, an independent media forum, held its first documentary film festival in December 2004, with a focus on "letting silences speak," giving voice to the silenced. For a write up on the festival, see India's National Newspaper, The Hindu. THE 8TH INTERNATIONAL LABOR FILM & VIDEO FESTIVAL, Seoul, South Korea. Hosted by Labor news Production and sponsored by the Korean Film Commission (KBC), Korean Confederation of Trade Unions (KCTU) and MediACT, the Eighth Seoul International Labor Video and Film Festival was held November, 2004. Bloodletting joined a truly international line-up of fascinating and original stories of workers throughout the world. COMMUNITY SHOWING: April 16, 2005, 10 a.m. HOSTED BY Earl Ofari Hutchinson at the Los Angeles Urban Policy Roundtable, at The Lucy Florence Coffeehouse, 3351 W. 43rd St., L.A. 90043. COMMUNITY SHOWINGS: April 4 & May 12, 2005 NEW MEXICO! In cooperation with the LA Coalition in Cooperation with Cuba, the Workmen's Circle in Los Angeles presents the feature documentary, BLOODLETTING. For more information on the Coalition, you may subscribe to their e-mail list by sending a blank e-mail to CubaLosAngeles-subscribe@yahoogroups.com. Producer Nicole Moore & Director-Writer Lorna Green address audience in Larkspur, California. If you have organized a community showing that you would like listed on the website, please contact webmistress nicomo@eatmos.com. Thank you! As interest in BLOODLETTING grows nationwide, Prairie Miller of WBAI interviewed Director Lorna Green about her timely documentary, BLOODLETTING: Life, Death, Healthcare. "Especially in this election year, we have to put the issue of healthcare in the forefront," Green said. "Too often, the day to day lives of uninsured people like my mother are forgotten with the hubbub surrounding high stakes politics," she continued. "You can't build a healthy economy without people being healthy." Green's interview aired on July 13th, 2004. Recent interest in BLOODLETTING is also reflected in Latin American press. See this article that appeared in the Spanish-language wire, Notimex. Press & media invited to use our EPK. Resources available include story summary, stills, recent press releases and press coverage, and more.